While at GenCon, I had the pleasure of meeting a lot of people, but few showed as much hospitality as the group from On the Lamb Games. I had the pleasure of talking with Emily Fontana (Supreme Ruler of the (Brushfire) World) and then playing a demo of said Brushfire game with Nick Hedge rules-writer for OtLG. So starting with Supreme Ruler Emily, the first bit of business was about their successful Kickstarter that they ran and how things have been progressing since then. The last 2 factions were fully funded and they, along with several new characters, were being sculpted as we talked (unfortunately, it wasn't right there in the room, or I would've gotten pictures). Also, the artwork for the 3 high-level backers was all done. We've posted up the photos of those previously. I got a chance to see some of the originals as well, and they looked awesome. The next projects they're working on are the Black Kiwi for Warstore Weekend. That made me more excited than I originally thought it would. Just thinking about it, the idea of a grim reaper riding a huge kiwi just sounds awesome. Speaking of absolutely awesome models, there is a battle turtle still in the works. It's going to be massive. Moving over to the more RPG-side of things, there are plans for two more Historia Rodentia books coming soon from Mongoose Publishing. They are going to be more along the lines of an "advanced player's guide," said Emily, and allow for many more variations and options for characters in the system. Who doesn't love more options? There's also an Axony book (like the British of the Historia Rodentia world) that's going to expand greatly on that particular part of the setting. Emily also talked about an "Endless Fantasy" Kickstarter project they will be starting in short order. 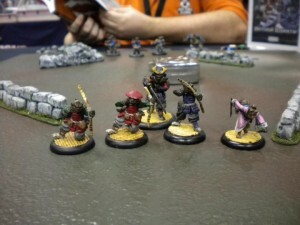 It was described as sort of a "Final Fantasy Tactics"-style game using 40mm figures on a grid board. 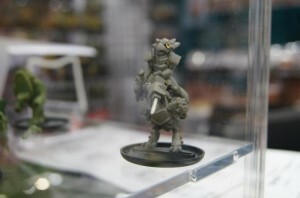 The models would represent sort of classic RPG-class figures. More to come from that soon. Moving over to the demo half of things, I got to play a game versus Nick Hedge. Now, I'd not known anything about the rules for the game going in, but within very short order, I was able to get them down (even in my distracted state of, well, being in GenCon and it was getting later in the afternoon). I was playing the Ribenguo, sort of the Japanese-inspired faction. Meanwhile, I was facing off against the French-inspired faction headed up by a Mole in the role of Napoleon. The starters shown are about 25 points apiece. A normal game is between 100 and 200, so we're starting off pretty small here. Each model actually has 3 resources that they use in order to put them into your force. There's gold, food and wood. You're only allowed so much of any resource, so this can create times where you may end up having to make tough decisions during army composition. It at least varies up the armies some, as it'll make it so not every type of model can be used in every game. I sort of like that. The game uses an "alternating activations" format (finally getting the terminology right on that one). That is to say, I activate a model/unit and do everything with them I'm going to do, then you do the same with one of your models. As previously-mentioned, I really like that in games. It keeps it from being where your opponent has a half-hour turn and you just sit there and occasionally remove a model. It keeps you much more interested in what's going on. 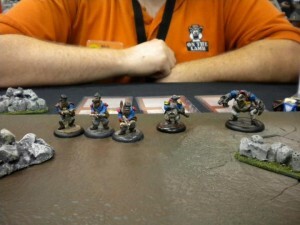 The game gets even a little more granular, as you can even activate just a few models out of a unit if you want. Obviously there are advantages to activating them all at once, as you can combine their attacks, but you also are able to split their fire/attacks as you see fit if you choose to break them up. The game is exclusively a D10 system. All rolls are basically "Stat+d10 roll." They are also almost always opposed tests, where it's my roll+stat versus your roll+stat. Again, this helps keep you involved in the game as there's always something for you to do, even during your opponent's turn. Another general rule is the ability to pre-measure. There's been some buzz about this lately with the change-over for 40k. My jury is still out on it. I don't mind not being able to pre-measure, but it's not a major selling point for me. I think a lot of people make it into a much bigger thing than it needs to be. But anyway, the game has it. Just sayin'. As mentioned, the game was exceedingly quick to pick up the fundamentals. Attacks use a single D10. Using multiple weapons will give you more D10 rolls, but your opponent will always just roll 1d10 to defend. If you roll a 10 on your attack, it is a critical hit and will ignore your enemy's armor. Armor is the game is basically like Damage Reduction. If you hit with an attack, each weapon has a set Damage that they do. You subtract the enemy's Armor from the Damage and that gives you how many wounds dealt. When you've lost all your wounds, you lose your models. Standard troopers have about 2 wounds each, while solos tended to have 4. Of course, there are fun things like armor piercing or quick shot that can give you more attacks or make your attacks more deadly. 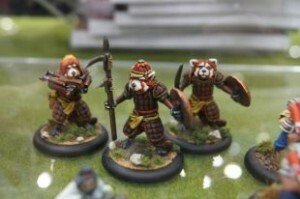 I do want to say that while they fought valiantly for their leader, the forces of the Mole Napoleon could not stand against my Tanuki Samurai's. Moleman even got an arrow to the face, poor fella... though that wasn't as bad as when he got shot in the back from his own crossbowmen trying to get rid of the fox shinobi that was closing in on him. Ouch. All in all, it was a good demo. The models were very highly detailed and full of individual character. There's a worry with doing anthropomorphic animals that things could get too "cartoony" but I think OtLG does a good job of still making the models look like wargame models, and not just pewter mini-statues you'd get at a theme park giftshop. I would suggest checking out Brushfire for yourself and maybe take a look at Historia Rodentia while you're at it. A review on that will be coming in the next couple weeks as well.